I've had this idea bubbling round for a bit now. The ideas is to hold a themed monthly twitter party where you can tweet blog post links, photo's or just a little description of parenting ideas around that month's subject. We all know how busy people are and so a monthly linky will also run to allow you to continue linking your posts for that subject, in case you can't make the twitter party. Becky and I will choose our favourites and will both create a monthly showcase post, I'll also create a home for all the posts and will continue to advertise through twitter or pinterest shared boards. You don't have to include the badge in your blog post if you don't want to but spreading the word and re-tweeting would be really appreciated! The link will be up on both our blogs on the first Monday of each month. 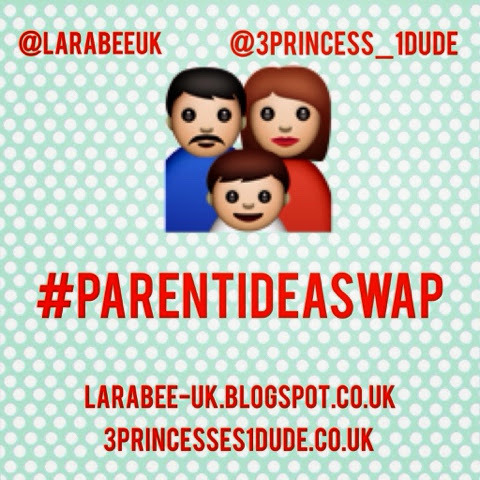 So, we're thinking the first theme will be 'children's snacks' from babies to toddlers to schoolchildren to family snacks, tweet your blog post, pictures or just a description, use the #parentideaswap and we'll re-tweet and post all linkable entries to my #parentideaswap pinterest board. The twitter party will be held 8-9pm on the first Monday of every month, first starting on Monday 2 February.